Figure 1. A hypothetical small plot with two treatments (A & B) and four replications of each treatment. Plots appear to be placed in regular rather than randomized order. Paulo Pagliari, University of Minnesota Extension soil scientist, and I recently modified an EXCEL spreadsheet designed to help crop producers and other ag professionals analyze on-farm experiments. This spreadsheet allows you to enter yields for two or three treatments (varieties, pesticides, fertilizers, etc.) with three to eight replications and calculates treatment averages and statistical differences. 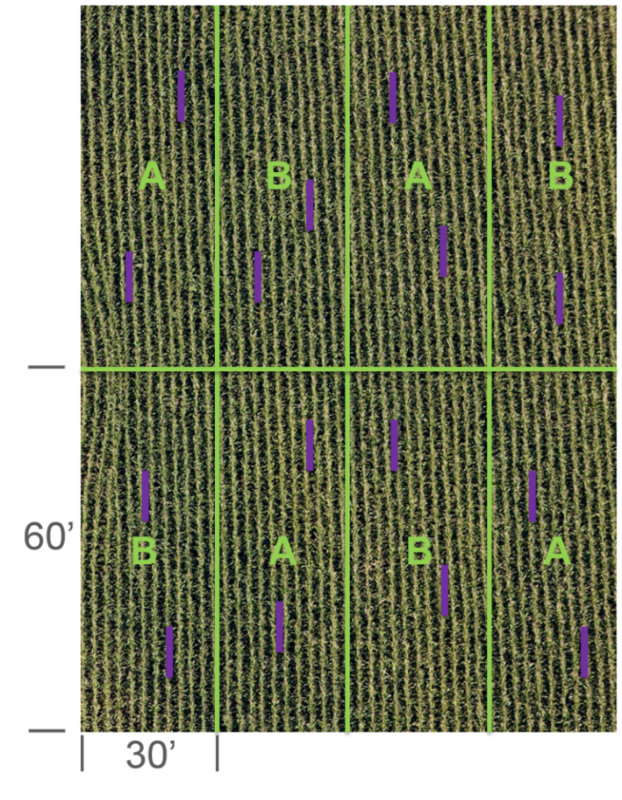 In addition to yield, the spreadsheet can calculate differences between crop stands, insect, disease and weed control tactics and other variables. This spreadsheet is not, by any means, bug-free polished software, but you might still find it useful. A link to download the spreadsheet along with some advice on setting up and analyzing simple on-farm experiments is contained in the University of Minnesota Extension article, How to do research on your farm. 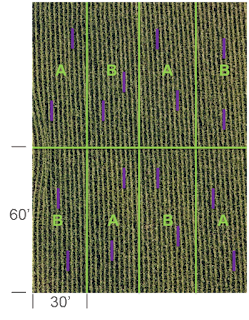 During 2017, the Minnesota Corn Research and Promotion Council and the Minnesota Soybean Research and Promotion Council have funded multi-site experiments to investigate the yield response of foliar fungicide applications to corn and soybeans. These will be small plot experiments located at University of Minnesota Research and Outreach Centers. You can use the tools described above to help set up your own version of these trials. If a number of you are interested in conducting an experiment like this and willing to share your data, I would be willing to pool and analyze the data across sites. Enjoy trying out the software - it's a work in progress. Feel free to contact me at bpotter@umn.edu if you are interested in participating and sharing data.